David Warner held a press conference and his wife Candice Warner was right there to support him. The sacked vice-captain, who was banned for 12 months by Cricket Australia after being accused of masterminding a ploy to scuff the ball illegally in Cape Town, broke down during Saturday’s press conference. 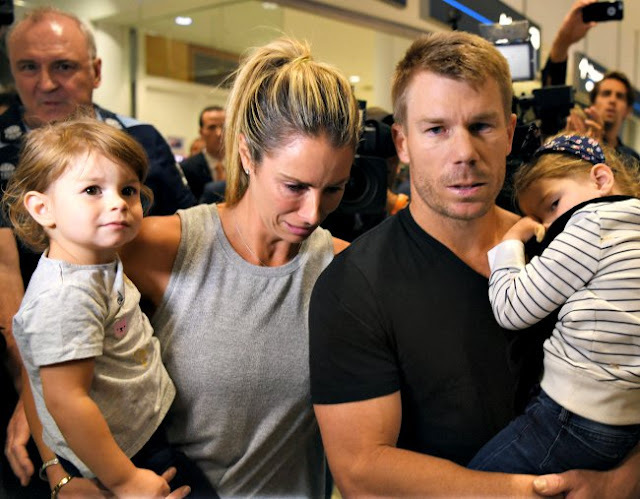 Warner became very emotional when apologising to Candice and the couple’s two young children for “putting you through this”. Warner was widely criticised for not answering questions directly at the press conference. "He is hurting. He is seriously, seriously struggling and he’s not in a great headspace,” Candice told News Corp Australia. “He’s just such an emotional wreck. “I feel like it’s all my fault and it’s killing me — it’s absolutely killing me. “I haven’t been much of a support because I’ve been a wreck. “I’m really not well," she added.